For executives seeking to improve organizational decision-making and extract more value from assets, Steve's interview with leadership expert Rodger Dean Duncan is a must read. The first ever INFORMS Government and Analytics Summit in Washington, DC provided attendees with a rich, non-technical perspective on how operations research and analytics can be more broadly utilized by policymakers and federal government leaders. 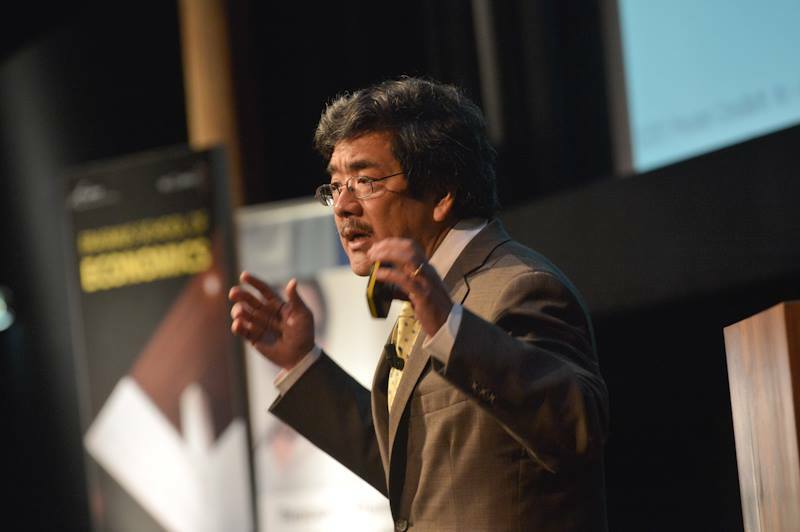 As an expert panelist, Steve Sashihara discussed advanced analytics and tech disruption. Blockchain is a potential game-changer according to rail industry adopters, reports Progressive Railroading. Princeton Consultants CEO Steve Sashihara explains why Blockchain is important and how executives need to think about the tech disruptor. What is freight Uberization? What are the common arguments why freight won't be Uberized--and are they valid? What are the forces that are combining to change transportation? Princeton Consultants CEO Steve Sashihara answered these questions and more during his keynote at the Stifel Transportation and Logistics Conference in Miami Beach. Princeton Consultants CEO Steve Sashihara appeared on Road Dog Trucking Radio, the popular program on Sirius XM. Steve discussed disruptors, such as autonomous trucks, with host Mark Willis and a series of callers who described their experiences with new technologies in the cab, at the loading dock, and on the road. At the Commercial Carrier Journal Symposium, an annual gathering of transportation leaders, Princeton Consultants CEO Steve Sashihara led a panel discussion on the future of freight movement. Watch the CCJ video here. In the second part of its coverage of Princeton Consultants CEO Steve Sashihara's recent presentation about digital disruption in freight transportation and logistics, Fleet Owner emphasizes that the Internet of Things and Big Data are "the big drivers of success going forward." Executives need to be much more data-driven and leverage two types of analytics. Read the Fleet Owner article here. Based on the teleconference with Princeton Consultants CEO Steve Sashihara and Stifel Capital Markets Managing Director of Research John Larkin, Tiffany Hsu of Trucks.com analyzed the top disrupters that will impact freight transportation and logistics. Read the Trucks.com article here. At the Surface Transportation Summit, which assembles top Canadian transportation executives, Princeton Consultants CEO Steve Sashihara participated in an expert panel on the state of freight transportation and logistics. Steve presented the findings of a recurring Princeton Consultants survey regarding potentially disruptive technologies in freight transportation, such as driverless trucks, the Internet of Things, and Big Data—comparing the results between US and Canadian survey participants. Steve has been appointed to the Board of Directors of the Association of Management Consulting Firms (AMCF). Steve has previously served as AMCF co-chairperson. Since its founding 1929, AMCF remains in the forefront of promoting excellence and integrity in the profession. AMCF provides a forum for the exchange of ideas, helping consultants to better understand developments within the profession and to capitalize on new opportunities. Membership is diverse: large and small firms, traditional management consultants as well as providers of professional services, generalists and specialists, single-office firms along with multinational organizations. For more information, visit the AMCF website. At Columbia University, Steve participated in a “Careers in Analytics” event for students. Steve was joined by (left to right) Anne Robinson, Executive Director of Strategy and Forward Supply Chain at Verizon Wireless, and past president of INFORMS; Jack Hymanson, Principal Solutions Architect at SAS Institute; Tracie Cambies, Internet of Things Retail leader at Deloitte Consulting; and Evan Levine, Director of Analytics at the Counterterrorism Bureau of the New York Police Department. For an audience of Carnegie Mellon PhD and MBA students, faculty and Pittsburgh executives, Steve discussed optimization and its growing impact on businesses and careers. Steve was invited through the INFORMS speaker series, which brings optimization leaders to university campuses. Read an event summary at the INFORMS Student Chapter at Carnegie Mellon webpage. Award-winning reporter Jaclyn Trop interviewed Steve about the testing and potential deployment of driverless trucks. The story was spurred by the US Army's upcoming test in Michigan. David Cullen of Heavy Duty Trucking reports on Steve's survey and presentation about the future of freight transportation. At the FTR Conference in Indianapolis, Steve discussed the findings of a survey regarding potentially disruptive technologies in transportation, such as driverless trucks, the Internet of Things, and Big Data. Survey participants were executives at carriers, shippers, suppliers and other organizations. For IBM, Steve conducted a webinar, "B2B Pricing: Optimization, Disruption and Innovation." Steve addressed how a company can improve B2B pricing and service to maximize profitable growth. He discussed techniques and solutions in optimization and advanced forecasting, as well as Big Data challenges and opportunities as they impact pricing. Steve presented "The Executive Guide to Optimization" for 130 members of the New Jersey Society of CPAs. Steve drew from The Optimization Edge and addressed questions regarding optimization applications for small businesses, service industries, groceries, and other areas. For IBM, Princeton Consultants CEO Steve Sashihara conducted a webinar on supply chain optimization. Steve discussed how optimization drives game-changing improvements in efficiency and service, by making recommendations for an organization's physical network, product flow path, inventory levels, and transportation and logistics. For the Association of Management Consulting Firms (AMCF), Steve gave a presentation on Big Data and Optimization, then led a discussion of opportunities in the consulting industry. Steve was a guest speaker at the Avoca Quality Consortium Summit, a gathering of pharma, biotech, CRO and healthcare executives. Steve spoke on the topic of "Applying Optimization to the Clinical Trials Process." He is pictured with Patty Leuchten, CEO of The Avoca Group, who organized the event. If your organization is a factory for making decisions, how can you best measure and improve output? How can private and public sector leaders take advantage of optimization? Steve addressed these and other issues at GE's Minds + Machines Conference in Chicago. Ortec named its interview with Steve one of its 10 best blog posts of 2013. Steve discusses the value of optimization in an environment of Big Data and increasing complexity, in this video posted by Ortec Consulting Group. Steve Sashihara was a featured speaker at GE’s Mind + Machines conference in Chicago. GE CEO Jeff Immelt and other executives discussed the state of the Industrial Internet from the shop floor and data center to the boardroom. Steve discussed The Optimized Industrial Business and introduced a maturity model to help companies assess their state and select areas to start optimizing. 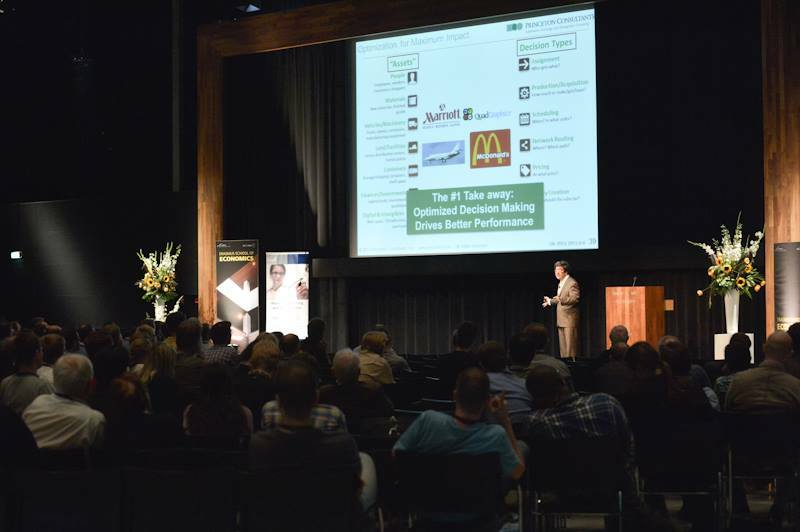 On September 6, Steve was the featured speaker at OR2013 in Rotterdam, an international conference of the operations research community. Steve discussed how optimization specialists are making a greater impact on industry and society. For the third consecutive year, Steve was a guest speaker at Smarter Commerce. In Nashville, he conducted two sessions: "The Executive Guide to Optimization" and "Boosting Asset Utilization to Enhance the Customer Experience and Save Millions." Steve Sashihara was the guest speaker of the Trenton Rotary Club. He explained how optimization improves decision making and drives improvement. Undergraduate and graduate students in Industrial Engineering and Operations Research attended an event hosted by the Columbia INFORMS chapter that featured a panel of guest executives: Anne G. Robinson, Director of Supply Chain Strategy & Analytics of Verizon Wireless and President of INFORMS, Steve Sashihara, CEO of Princeton Consultants, Jack Hymanson, Principal Solutions Architect at The SAS Institute, and Evan Levine, Analytics Lead at the New York City Police Department's Counterterrorism Bureau. In 2013 Princeton Consultants CEO Steve Sashihara will serve as treasurer of the INFORMS Roundtable, a group representing top-level leaders in applied optimization for large businesses. The complete board is comprised of: Jon Owen - Past President (General Motors), Bill Browning - President (Applied Mathematics, Inc.), Jeff Winters - President-Elect (UPS), Kathy Lange - VP, Membership (SAS Institute), Mike Grant - VP, Meetings (The Boeing Company), Mark Hayward - Secretary (The Mayo Clinic), Steve Sashihara - Treasurer (Princeton Consultants). Steve Sashihara moderated a roundtable discussion of Big Data, Business Analytics and Optimization at the headquarters of Financial Executives International (FEI) in Morristown, NJ. Optimization Opportunities in Supply Chain Management. The INFORMS Philadelphia chapter hosted an event at which Steve was the guest speaker; his topic was "the two sides of successful optimization. Sponsored by Princeton Consultants, the INFORMS Impact Prize is awarded biennially for lifetime achievement in operations research and analytics. This year’s honorees created Algebraic Modeling Languages, which effectively translate mathematical models into computer languages, and helped move optimization from the classroom to the boardroom. Read more about the Impact Prize here. “How to Optimize, Reinvent and Maximize Your Business.” Princeton Consultants CEO Steve Sashihara was interviewed by Rodger Dean Duncan, PhD, an author, speaker, trainer, and executive coach known for his expertise in the strategic management of change. Princeton Consultants CEO Steve Sashihara was a guest speaker on the subject of Optimization at a training session of the Analytics group of Bank of America / Merrill Lynch. Steve Sashihara contributed the article, “Teaming Man and Machine to Optimize.” Topics include: overcoming the barriers to widespread adoption of optimization, optimizing sales, and where optimization is working. Andrew Zezas of CFO Studio interviewed Princeton Consultants CEO Steve Sashihara about improving organizational performance and decision making through optimization, from a CFO’s perspective. discussion of Big Data and its impact on management consulting. Princeton Consultants CEO Steve Sashihara contributed an article about Big Data and Optimization to the current issue of European Financial Review. Princeton Consultants CEO Steve Sashihara was the guest speaker at a Princeton Regional Chamber of Commerce event. He discussed the principles, techniques and benefits of optimization. Princeton Consultants CEO Steve Sashihara was one of 15 management consulting firm leaders who were interviewed about what they felt about the year ahead. McGraw-Hill’s management blog features The Optimization Edge. Steve Sashihara was the guest speaker at the New York chapter of INFORMS. His topic was "The Optimization Edge." Steve Sashihara, Princeton Consultants CEO, and Joseph Kornik, Editor-in-Chief of Consulting Magazine. Steve Sashihara presented “5 Steps to a Successful Optimization Project” to members of the Boston Chapter of INFORMS and students at Bentley University and other area schools. Information technology and management consultant Steve Sashihara offers a complete guide to optimization... He shows managers how to present an optimization program to all levels of their companies, starting with decision-making managers. Steve Sashihara and Princeton Consultants Director Dinesh Maneyapanda recently toured a temperature-controlled distribution center to assess optimization opportunities. Steve Sashihara presented "5 Steps to a Successful Optimization Project" at IBM's inaugural SmarterCommerce Global Summit in San Diego. Steve Sashihara has been appointed to a four-year term to the Advisory Council for the Department of Operations Research and Financial Engineering at Princeton University. Steve Sashihara and Princeton Consultants are profiled in the current issue of U.S. 1. Read David F. Carr's review of The Optimization Edge and the recap of his interview with Steve Sashihara, which explores improved decision making, false boardroom assumptions about IT investment, and a game-changing app for cloud computing. 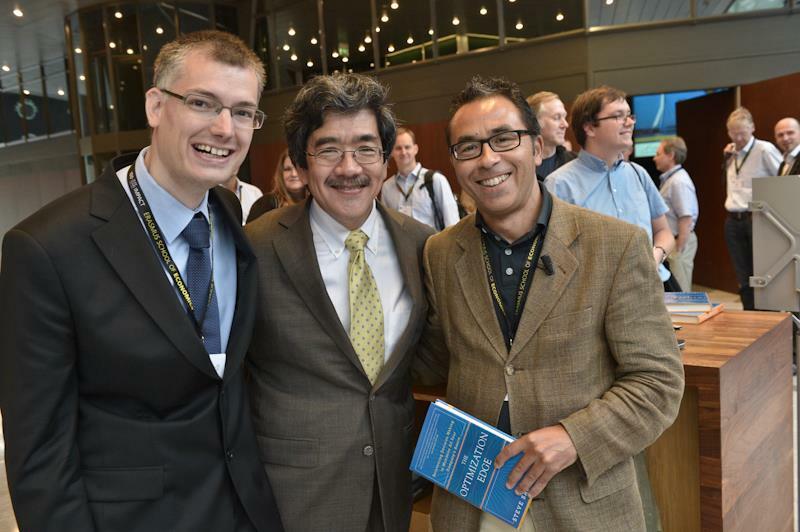 (Left to right) Roger Carlile, Chief Administrative Officer, FTI Consulting; Louis-Pierre Piris, IBM Consulting Services Leader, France; Steve Sashihara, CEO, Princeton Consultants. The 2011 European Leadership Forum was presented by the Association of Management Consulting Firms (AMCF). The Forum took place in Paris. How is optimization a game-changing competitive advantage? How has Intel achieved a 10% boost in production and cost benefits measured in the hundreds of millions? How has UPS saved 30 million miles in travel each year? To find out, Investor’s Business Daily interviewed Steve Sashihara of Princeton Consultants, Karl Kempf of Intel and Jack Levis of UPS. "Sashihara explains the 5-step methodology for optimization--from selecting and designing the project to leveraging the benefits... The value of The Optimization Edge is introduce executives, through scores of specific examples and in clear and concise prose, to the potential of optimization to reallocate resources and make the most of their companies' assets." The Optimization Edge is on CIO Magazine's What We're Reading Now List. Congratulations to UPS for winning the 2011 Gartner Business Intelligence (BI) Excellence Award. The company’s groundbreaking work in optimization and operations research, for which it won this prestigious award, is featured in The Optimization Edge, as is the role of Jack Levis, UPS’s Director of Process Management, who accepted the award. The award recognizes business results gained from integrating business, decision, analytical and information processes. The theme reflects a basic value of Princeton Consultants - offering integrated optimization solutions for today's business organizations. Steve presented and discussed his new book, The Optimization Edge, at the INFORMS Roundtable in Chicago on April 10, and signed books at the INFORMS Business Conference on Business Analytics and Operations Research on April 11-12. Barry List of INFORMS interviews Steve with a terrific downloadable podcast about The Optimization Edge and its implications for businesses. 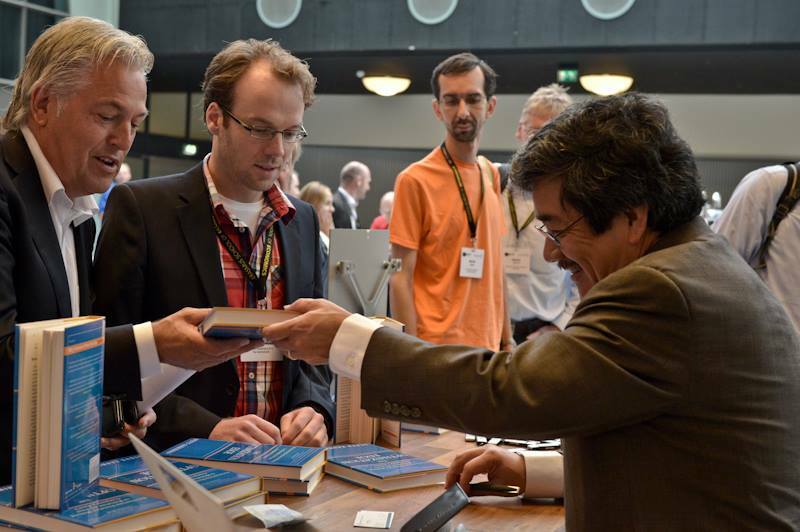 Steve Sashihara's latest book, The Optimization Edge, is now available at bookstores and on-line. We welcome your comments and reviews! Steve thanks everyone, especially the interviewees who shared so generously their time and wisdom to make this book possible. How have Google, Marriott, McDonald’s, UPS, and other industry leaders outperformed all their competitors, leaving even their closest rivals far behind? Steve Sashihara’s forthcoming book goes behind the scenes, revealing that the success of these companies, along with other powerhouses such as Amazon and Walmart, hinges on their ability to use Optimization to make strategic and day-to-day operational decisions. —Kenneth M. Koziol, Corp. Sr. Vice President, Innovation and Design, McDonald’s Corp.